Inserta Products Inc. | Fluid Power, Inc.
INSERTA® Flange Type, 2-Port Ball Valves, Stainless Steel, can be installed on or between other components such as pumps, motors, actuators, filters, valves, and manifolds using an SAE 4-Bolt flange or other clamping device. Consider the use of an INSERTA® IFRA Rotational Retainer in order to make a captive assembly. The metallic elements of the valve are primarily made from 2205 Duplex Stainless Steel and 316 Stainless Steel* for high pressure service in corrosive environments, or with fluid media that would typically be incompatible with the standard materials of the INSERTA® IBF Flange Type 2 Port Ball Valves. 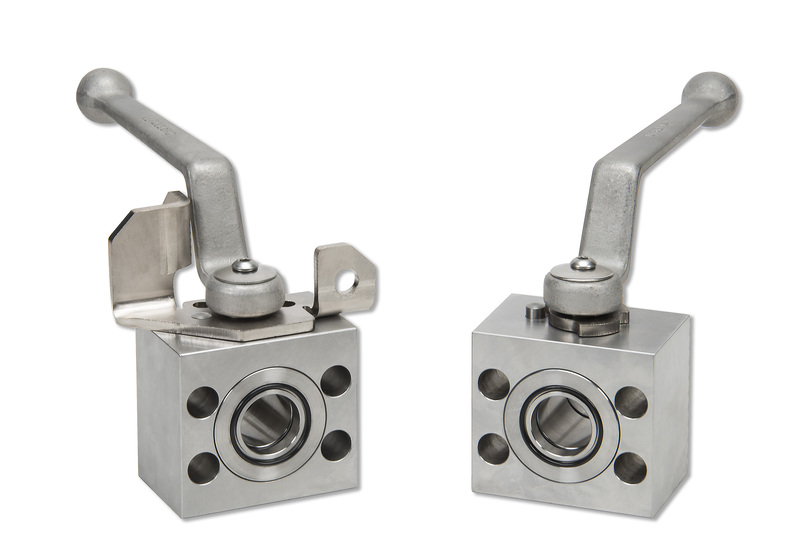 INSERTA® Flange Type, 2-Port Ball Valves, Stainless Steel, have two ball seals, one for each port (i.e. for ports 0 and 1). When the valve is in the closed position the port that is subject to the higher pressure urges the ball against the ball seal on the opposing port side. In each case it is the seal on the side of the lower pressure port that creates the ball's directional control valve seal. Each valve is provided with an offset stainless steel handle. A universal lockable stop plate is available as an option. Screw clearance holes are compatible with either metric or UN fasteners. Maximum working pressures indicated are for a 4:1 safety factor to burst. Valve Body made from high strength duplex stainless steel.